The line from Southgate to Oakwood passes through what was once part of Enfield Chase, and latterly parkland that belonged to Oak Lodge. This is now part of Oakwood Park. The land falls mainly to the east. This section of line is notorious during the leaf fall season. In the autumn of 2017 two special ‘RAT’ trains were put into service to deal with the problems encountered along here in order to prevent a repetition of the autumn 2016 debacle when most of the Piccadilly Line’s stock developed wheel flats. These ‘RAT’ trains are specially adapted three car trains of 73 stock and pictures can be seen here including equipment used to treat the tracks. Leaf fall sign by the signal just before Oakwood station. Oakwood is perhaps the ultimate example of the Holden “brick boxes with concrete lids.” Its acclaimed as “one of the most highly regarded examples of Charles Holden’s ground-breaking Modernist designs for the Piccadilly Line extensions of the early 1930s.” Sudbury Town station (on the western branch to Uxbridge) was of course the original brick box with concrete lid, however Oakwood is a refinement and in fact a much nicer building. 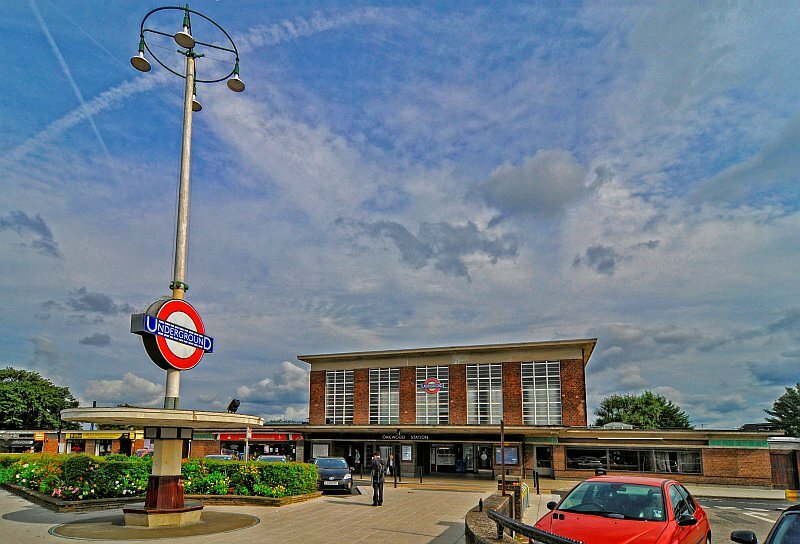 Despite Oakwood’s somewhat austere appearance from the outside, it does have surprises, including integral shop units, grab rails on the sides of the entrance doorways, and platforms that evoke the design used for both Uxbridge and Cockfosters. The nice touch however is the pylon with circular canopy and seating, a single example of the pair found at Southgate. For me this is the best example of the three because the pylon is in its element. Its not cluttered, crowded out, by lights and other street furniture that spoil the appearance of both pylons and station at Southgate. The Oakwood pylon is subtly different from those at Southgate. The circular brass light housing is much larger than Southgate’s. The surrounding flower bed and circular base floor are later additions but enhance the pylon rather than take away from it. Oakwood’s station pylon, showing its larger light housing. 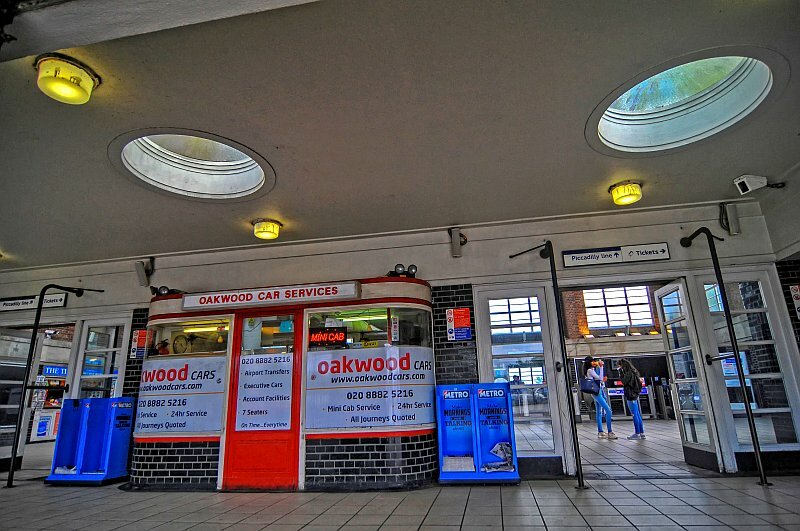 According to the LT museum’s blog, instead of the ‘UndergrounD’ name, ‘Oakwood’ was once depicted on the roundel “but was replaced a few years ago” back to an ‘UndergrounD’ sign. I cant find any photographs of this so do not know if it is for certain. The light tower/pylon with its seating and circular floor – a later addition. A puzzle with the roundel on the pylon is photographs from May 1933 show this roundel facing towards the station itself in addition to it facing along the road. I had to examine photographs and maps to see what was happening. Originally the pylon was built with the roundel facing the station. However it seems during the first month of opening the road layout was changed. This was done to give the car park a more defined area, where previously this had been achieved with a string of chain posts placed upon the road surface. Whist those changes were being made, a decision was then made to switch the roundel round so it would face along Bramley Road. This is the position it has been in ever since. Its original orientation lasted just a matter of weeks at the most. In the above tweet the picture shows the station as first opened in 1933. To the right is a large station board. The remains of this can still be seen today as the picture below shows. The remains of the 1933 station notice board! Prior to 1933 the station was planned to be known as East Barnet but became Enfield West. Southgate Council didn’t like this and regularly complained to the LTPB because the station was within Southgate’s borough. (Today it would be no problem as its now in the borough of Enfield!). In time the LTPB honoured the matter by depicting Oakwood in smaller letters under Enfield West. Ultimately the original name was dropped in favour of Oakwood as the sole title holder. The pylon and station – the classic brick box with concrete lid design is evident. A different view of the station with its adjacent shopping parade. Oakwood station introduced a new concept in terms of tube/bus interchange. A huge waiting area was incorporated into the design with oblong seats where passengers could pass the time until their buses arrived. Charles Holden used the same concept at Cockfosters on a larger scale. These passenger waiting areas do appear to be based upon those little alcoves that can be found half way up the staircases at South Harrow station. However in this particular case it seems there was a reverse application and South Harrow took the idea from Enfield West. The bus passenger waiting area – one on each side of the entrance concourse. 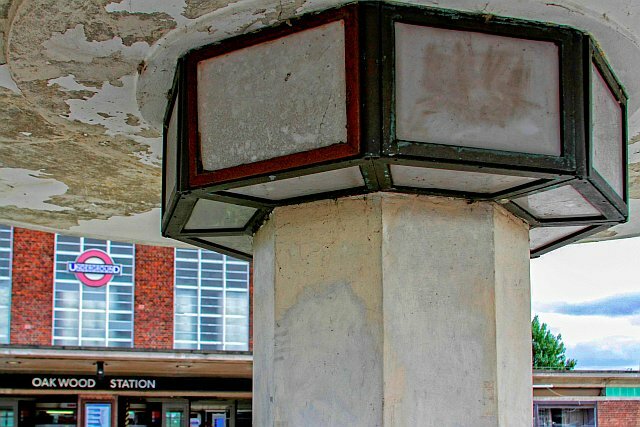 The dropped ceiling light shades that can be seen within the entrance concourse (and on the station’s platforms too) were once a fairly common feature at other Piccadilly Line stations. Of the three branches (Cockfosters/Rayner’s Lane/Hounslow) it seems Oakwood was very likely the first to employ these certain styled dropped shades as Sudbury Town used globe shades instead. Station entrance shop, grab rails (a later addition) either side of the doors and circular skylights. The shop units within the station seem to have derived from the original one to be found at Sudbury Town station. Interestingly all the clocks on the Cockfosters extension were based on the style of the clock at Sudbury. There was also a barometer at Sudbury in the shape of a clock however that unusual innovation didn’t get carried through to the new stations north of Finsbury Park. Enfield West (now Oakwood) Underground station, 1933. 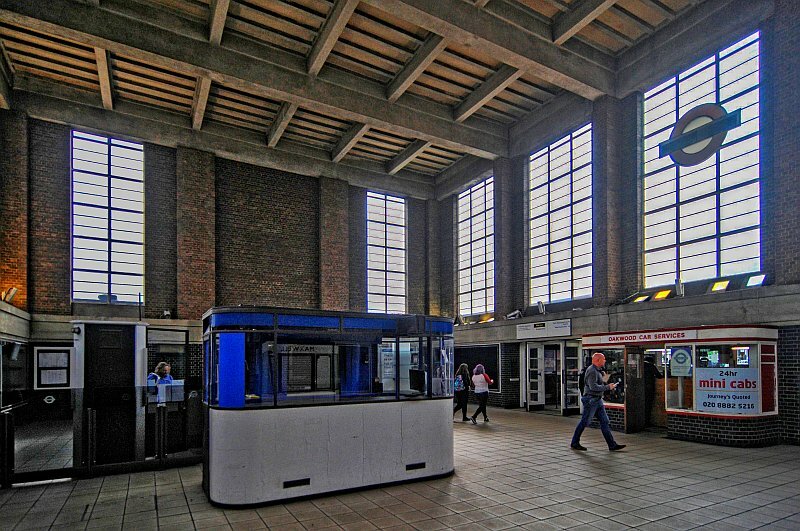 These interior shots of the main ticket hall at Oakwood show its substantial air space. if one thinks about it all the other stations on the line from Finsbury Park were actually rather small affairs. They sort of got bigger as the line progressed further north with Arnos Grove being the largest and airiest building so far. This and Southgate were circular, a radical change in the design. Oakwood is clearly a return to the original brick box with a concrete lid concept except it was made three times or so larger than Sudbury Town to make these rather austere interiors appear more lighter. Oakwood’s ticket hall, showing the high ceiling, large windows. The classic LTPB passimeter is evident. One quite evident departure at Oakwood as it was originally built is the lack of uplighters. Even those these were used at Sudbury Town, by this time they may have been seen as somewhat old fashioned, not quite fitting in with what could be considered almost brutalist interiors. Again, it was probably up to the architects (in this case C. H. James) what they wanted to see in the different stations. Further departures from the Sudbury Town design included the use of a detached kiosk. The spacious interior of the ticket hall gave designers more opportunity to develop further the early concepts found on the western branches of the Piccadilly Line. 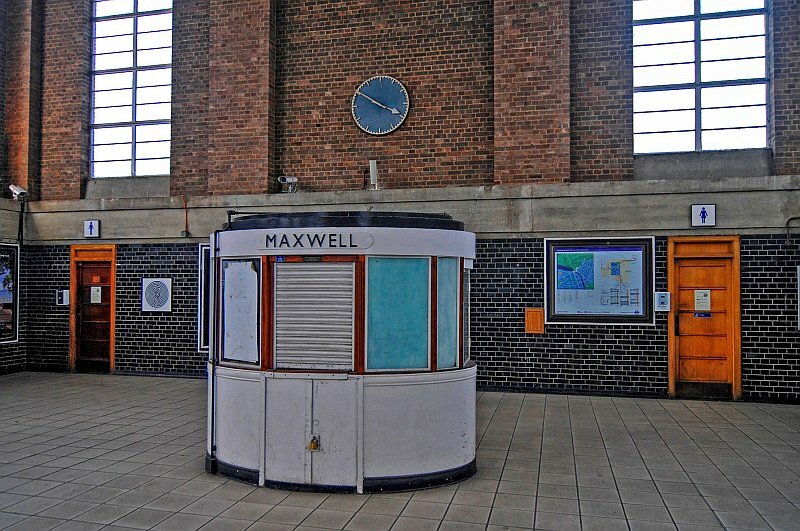 Classic kiosk at Oakwood.The clock is of the style used at several stations on the line. Heritage sign at Oakwood.It tells us C. H James was the station’s main designer. The platforms are accessed by the normal means of stairs or by way of a new passageway and lift. The latter was to comply with the requirements for disability access. Both Cromwell Engineering and Comast Construction worked to install this important facility in 2007. The access concourse consists of a glass fronted passageway leading from the ticket hall across the platform canopies to a lift which emerges on the platforms, almost immediately in front of the entrance staircase. The steps at Oakwood with the new disabled access concourse visible through the windows. 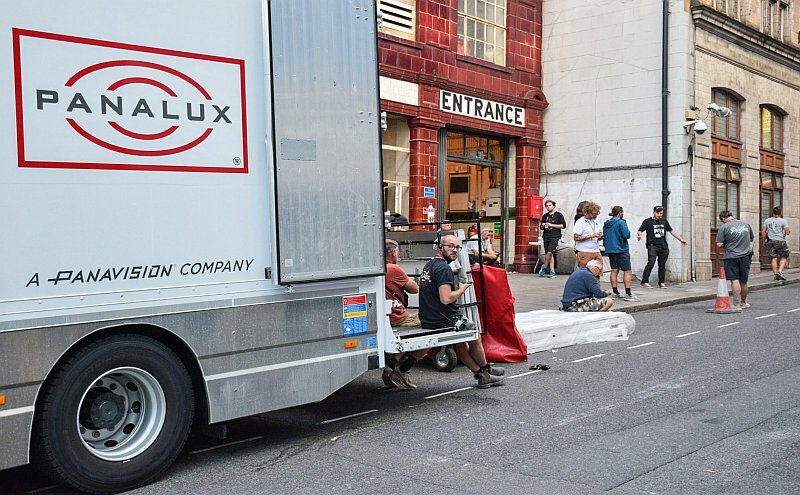 Sadly there has been concern with this new facility because the lift has been regularly out of use due to lack of trained staff, thus denying many disabled people the chance to use the tube. MP Caroline Pidgeon described the failures as a disgrace. See Enfield Independent. Next: Oakwood part 2 – station platforms, depot, etc.